Washington Federal recently leased retail space at Park Place Shopping Center. Courtesy. ▶ FJM Valley View Associates LLC purchased 161,866 square feet of industrial space in DW Valley View Business Center at 5959 and 5979 Valley View Blvd., 3873 and 3911 Oquendo Road, and 3850, 3876, 3900, and 3950 Ponderosa Way in Las Vegas for $10.2 million. Suzette LaGrange and Kara Walker of Colliers International represented the seller, DW Las Vegas LLC. Dean Willmore, Mike DeLew, Greg Pancirov and Chelsy Cardin of Colliers International represented FJM Valley View. ▶ Artsy Nannies leased 2,302 square feet of retail space in Village Square at 9420 W. Sahara Ave., Suite 102 in Las Vegas for $308,000 and 64 months. Liz Clare and Jackie Young of Avison Young represented the landlord, G &I VIII Village Square LLC. ▶ Batesville Logistics Inc. leased 6,250 square feet of industrial space in Nellis Industrial Park #4 at 4434 Mitchell St. in North Las Vegas. Dan Doherty, Susan Borst, Chris Lane and Jerry Doty of Colliers International represented the landlord, Icon PAC Nevada Owner Pool 3 Nevada. ▶ FlightLine Films Inc. leased 4,800 square feet of industrial space in Arrowhead Commerce Center, Building 13 at 6255 S. Sandhill Road, Suite 500 in Las Vegas. Spencer Pinter, Dan Doherty, Susan Borst, Chris Lane and Jerry Doty of Colliers International represented the landlord, KTR LV II LLC. ▶ Greenhill Air Inc. leased 3,875 square feet of industrial space in Sunset Point Industrial Center at 573 W. Sunset Road in Henderson. Greg Pancirov and Mike DeLew of Colliers International represented the landlord, Sunset Pointe Group LLC. Renae Russo of Colliers International represented the tenant. ▶ Ivan Sher Ltd. leased 3,714 square feet of office space in Fort Apache Commons at 1215 S. Fort Apache Road, Suite 210 in Las Vegas. David Grant, Grant Traub, Andrew Kilduff and Chris Connell of Colliers International represented the landlord, LJT Properties I LP. ▶ F45 Training leased 2,000 square feet of retail space in Crossroads Plaza at 4985 S. Fort Apache Road, Suite 103 in Las Vegas. Al Twainy and Amelia Hyden of Colliers International represented the landlord, Crossroads Plaza LV. ▶ Washington Federal leased 1,273 square feet of retail space in Park Place Shopping Center at 9480 S. Eastern Ave., Suite 105 in Las Vegas. David Grant of Colliers International represented the tenant. 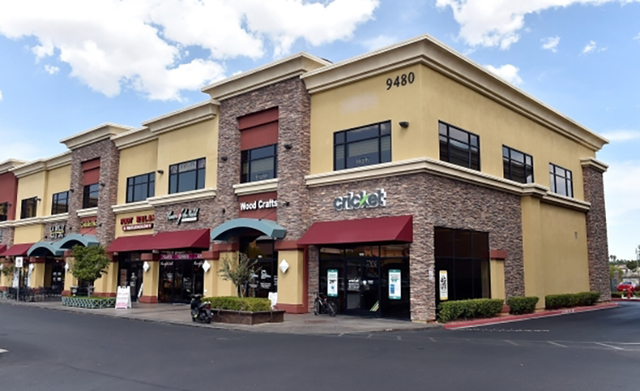 ▶ Glo LLC leased 1,200 square feet of retail space in The District Phase 3 at 2240 Village Walk Drive in Henderson. George Connor and Garrett Connor of Colliers International represented the tenant.